Priceless antiques have been stolen and hidden throughout Europe. The Professor calls upon her star student Adrianna to help her retrieve stolen antiques. 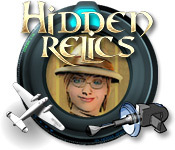 You will help Adrianna evade the evil thief as she travels Europe to locate the stolen antiques. Along the way you'll be able to get gadgets that help you uncover secret priceless artifacts from Mr. Gadget after solving fun puzzles. Hours of Hidden Object fun.